Dartmouth / Westport, MA – Looking for fresh air, exercise, or to learn more about the natural world around you? If so, this is the perfect trip for you! 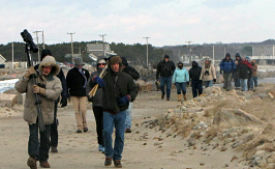 Join Research Director Mark Mello for a Lloyd Center tradition of 25 years and celebrate the New Year with a peaceful walk on Gooseberry Neck beach. 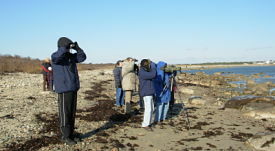 Focusing on coastal ecology and bird identification, Mark will identify winter waterfowl and ‘washed up marine life. January is a wonderful time of year to walk the coast and observe the effects of wave action on the slope and shape of the beach. This is a very informal outing, and those that simply want to walk are more than welcome. Participants should dress warmly and wear hiking boots; binoculars and cameras are recommended as well. 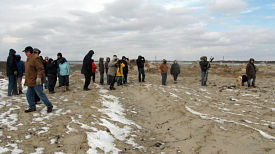 Participants are to meet at the Gooseberry Neck parking lot in Westport. This annual walk is free to the public, all ages welcome. No pre-registration required. If you have specific questions regarding the program, contact Mark Mello at 508-990-0505 x 22 or markmello@lloydcenter.org. The Lloyd Center for the Environment, a 501(c) 3 non-profit organization, founded in 1978 and situated with its headquarters and spectacular nature preserve overlooking the scenic Slocum River estuary, has achieved a well-earned reputation for excellence in environmental research and education. Through its innovative outreach programs, it has established itself as a highly regarded leader in the ongoing effort to raise awareness of the area’s fragile coastal resources and the importance of protecting them. The Center’s 82-acre property offers over five miles of walking trails, the “Bridge to Discovery” dock on the Slocum River, vernal pools, oak-hickory forest, freshwater wetlands, salt marsh, estuary views, and is home to two injured raptors (a screech owl and red-shouldered hawk). The Visitor Center is open from 10am to 4pm, Tuesdays through Saturdays, and on Sundays, June – September, free of charge. There, aquarium exhibits offer unique views of live freshwater and saltwater species of fish and other marine critters. The Center is also home to a fascinating collection of live local reptiles, amphibian and fish species. At the always popular touch-tank, youngsters learn the hands-on joy of socializing with gentle spider crabs, elusive minnows, sea stars (starfish), whelks, hermit crabs, periwinkles and mussels.